The "Orange is the New Black" actress was 14 when her parents were deported to Colombia. In her book aimed at teens, she describes the traumatic toll. 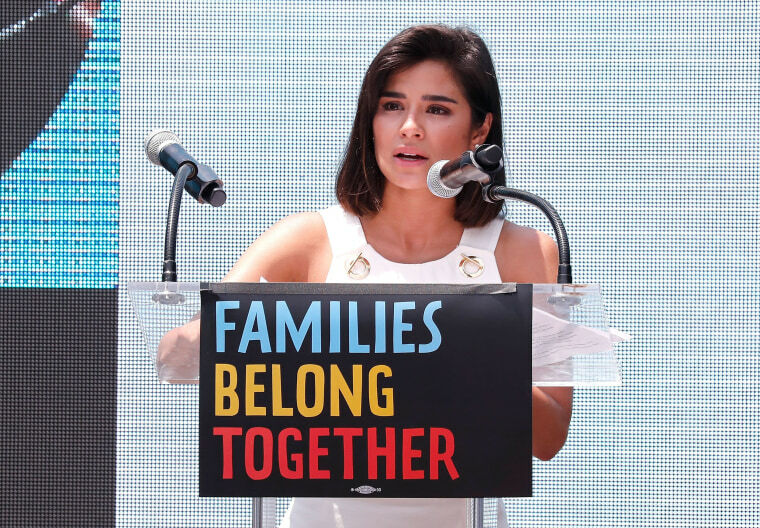 In her new memoir geared towards teens and young adults, TV actress and activist Diane Guerrero recounts how her 14-year-old life was turned upside down after getting home one day and finding her parents gone — they had been detained and deported. In "My Family Divided," Guerrero writes candidly about the toll the traumatic experience had on her mental health. Visiting her parents in jail, working multiple jobs to pay off debt and shouldering the responsibility of being her parents’ only hope for returning to America drove Guerrero to depression, self-harm and a suicide attempt. At a recent book reading and signing in New York City, Guerrero told a packed room — many had waited hours in line on a rain-soaked afternoon to attend the event — that they were not alone if they were going through immigration-related issues in their own families. Under the rose glow of hanging globe lights, Guerrero spoke for an hour from a brown leather armchair, captivating an audience ranging from elderly white men to Latina mothers to middle schoolers. The "Orange is the New Black" and "Jane the Virgin" star returned from a shopping trip to get sneakers to find her family home lifeless, with uncooked rice on the stove and a half empty coffee cup. Without warning, immigration officers had arrested her mother and father, who had come to the U.S. fleeing the violence in a rural part of Colombia and had overstayed their visas, building a life in the U.S.
After her parents were deported, Guerrero says the authorities never followed up about what happened to her. Guerrero, who was born in the U.S. and was an American citizen, was alone, eventually relying on family friends who helped her forge ahead. Her newly published book is a result of her first memoir, “In the Country We Love,” which entered bookstores in 2016. After community members told her they were using her book to teach students about immigration, Guerrero was inspired to publish “My Family Divided,” adapted for a middle school audience. Guerrero’s passion for performance began early. But personal storytelling goes against the grain for her. She kept her family trauma quiet as a teenager. Even today, it’s sometimes tough to shed her predilection towards privacy. I never really understood what a lifelong fight meant until now. Guerrero said her lack of education about the immigration system led her to feel shameful about her family's deportation. As “My Family Divided” enters stores, the nation has been grappling with the issue of migration and families following the Trump adminisration's controversial family separation policy. Guerrero’s activism predates the current momentum; she volunteers with Immigration Legal Resource Center, a nonprofit for immigration education, and Mi Familia Vota, a Latino voter engagement organization. Her immigration advocacy has taken her to the White House multiple times, starting with an invitation from former President Barack Obama after she published her family’s story in an L.A. Times op-ed. In June, she gave a speech in front of 30,000 protestors at the “Families Belong Together Rally” in Washington, D.C. Following the recent news, Guerrero said the thought of over 2,000 separated children motivated her to keep fighting and stay angry. Guerrero captured her audience with political ease, mixing lightning quips — “Yo dude, wake up,” to a fan whose phone alarm went off during the Q&A — with exhortations on Latino media representation. While she signed books, she bonded with fans over shared star signs (the cusp of Cancer and Leo) and mutual adversity. Citlali Pizarro, 20, talked to Guerrero about being the only Latina in her college’s acting program. Another young woman, Rebecca Rabello, told Guerrero the book made her cry in the DMV. Some young fans asked Guerrero for advice on how to make a difference, even if they aren’t old enough to vote.